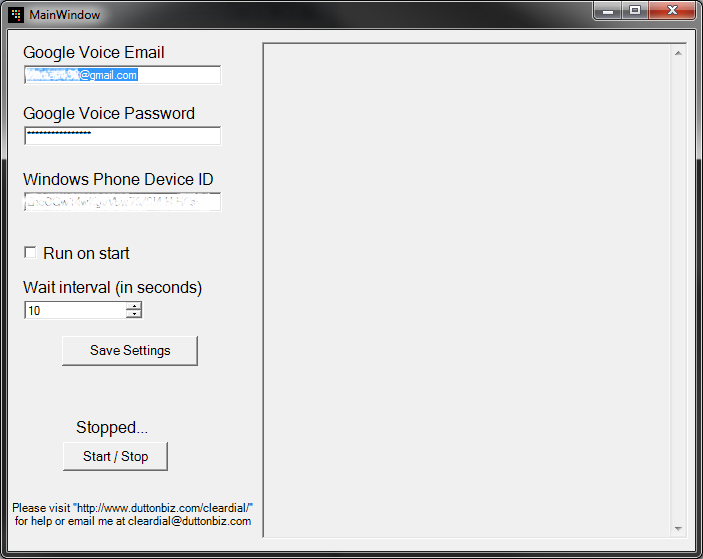 The Windows Notifier for ClearDial is to be used along side the ClearDial app for Windows Phone. It is required in order for your Windows Phone to receive notifications. You can download the Windows version of the notifier by clicking here. Once the application is installed, prescription you can set it as a start-up task on your windows machine to ensure that it opens up when you turn on your computer. Keep in mind that if this application is not running, page you will not receive notifications on your phone alerting you of new Google Voice messages. Simply start the application from your start menu. Fill in the required information. You can get your Device ID by opening up the ClearDial app on your Windows Phone, treatment go into ‘Settings’ and then click ‘Email my device ID’. This will then launch your default email account on your phone. You can then simply send the email to yourself and check your email on your computer. Copy and paste the device ID into the Windows Notifier application. You may miss something if you type it in by hand. You can use the ‘Run on start’ check box to decide whether or not you want the application to automatically start checking for new messages upon launch. You must click the ‘Save’ button in order for the new information to take affect. To have the application start checking for new messages, click the ‘Start/Stop’ button. The application will then start checking for new unread messages every 10 seconds (or whatever you have set for the ‘Interval’). To test that the application is working properly, have it “Running…” and then log into your Google Voice account and mark a message as unread. If everything is working properly, your Windows Phone should soon alert you that you have a new message. If you have any trouble or questions, feel free to leave a comment below. This entry was posted in Windows Phone and tagged apps, Google, Google Voice, Java, linux, Mobile, Windows, Windows Phone. You don’t have 2-factor authentication enabled with Google do you? That won’t work if you do unfortunately. Also, if you are still getting this error on your computer (the notifier app), log into to Google Voice on the web (www.google.com/voice) and make sure Google isn’t blocking it for some reason….you will see a message on the left side when you log into Google Voice if it is. trying to download the notifier on my nokia 635 but i cant seem to find the file after it is downloaded. i got win 7 from the windows store and i opened the file but i cant get it to download to my phone so i can use the app right. i tried to make calls and receive calls but they go thru my phone not the app or so it seems. can i set this so it calls out on the google number with out it using my phone mins. i am on a limited min acct with unlimited data. thx for any help. best to email a response. dont always check websites for answers. forget then it is too late when i get back to it. thx again for any help. I just sent you an email. Long story short, this app is not what you call a “VoIP” app. When you go to make a call, it will ask GV to connect you with the number you have in your settings…so it will ring your phone then connect you…thus using the minutes on your plan rather than using your data to make the call. Not having any luck getting this program to run installs fine open up smoothly. Input my google email address, password and the device id. But when I click the start button it crashes. Running windows 8.1 and have verified that .NET 3.5 is installed. Do you have any other suggestions? Sure enough, something seems to have changed slightly on the Google Voice page. I have tweaked the notifier Windows Notifier app and updated the post here. Do download the new one and that should do the trick for you. Let me know how it turns out. Thanks a ton for your reply here and reaching out rather than just giving up on the app! Hi there Sean. First off, thanks for making this, not having an option has been brutal. I shot you an email. Feel free to reply to the email or this post and we’ll see if we can get things working for you. Hi, I just installed Clear Dial and as soon as I open the computer application it tells me it has stopped working and then it shuts down. I tried to install .NET 4.0 but my computer told me I have a higher version, so apparently I am unable to install. Is a higher version bad juju for these purposes? Have I done something wrong? I’ve filled out all the information and whatnot and it’s not happening. Also, it doesn’t seem to be working on my phone either. It says refreshing inbox but nothing is happening. The inbox is always empty, despite the fact that I test called my GVoice number earlier and texted it, to see if things would show up in the app. Sorry for complaining; I’m full of hope that I can get this to work for me. Thanks! BTW: using HTC 8xt on WP8. Thanks for the comment and using the app! The notifier program actually needs .NET Frameworks 3.5. You can download it here (http://www.microsoft.com/en-us/download/details.aspx?id=21). If you’re not able to get that to work, let me know what version of .NET Frameworks you have and I can make a custom version for you. Is there any way I can dialout from phone instead calling back. That makes little inconvenience. Clear Dial isn’t a VoIP app so it is not able to use data for the calls. I’m looking into Windows Phone’s ability to to this but it will be some time till the app would be updated for this. When my phone is out of signal range for AT&T, but within WiFi range, will my Google Voice app be able to ring my phone and me talk over WiFi like I do with Talkatone on my Android phone? Sorry but no. Clear Dial is not a VoIP app. When you make a call through it, it just triggers Google Voice to call your phone and then connects you to the number you requested. I think there are a couple of VoIP apps out there for Windows Phone, but I believe you have to use your own PBX provider…where Talkatone would normally just set it up for you. The messages are not being pushed to my phone as they are received. Shoot me an email (sean@duttonbiz.com) with your device ID and we’ll see if we can figure it out. If you have just set up the notifier on your computer (assuming you’re using the Windows version of the notifier) you have to log into Google Voice again from the computer and let Google Voice allow the notifier. It blocks unknown computers from accessing your Google account…and the notifier uses my service on Dreamhost…so it may be waiting for you to allow “dreamhost” to access your Google Voice account. Does this app still work? And does it work with Windows 7 desktop and a Windows Phone? Yes, this app is still working. The desktop notifier works on any version of Windows as long as you have the .NET 3.5 Framework installed which is on most installs by default. If you run into problems, let me know. I’m working on a Windows Phone 8 version so that way you can enable lockscreen notifications. The current version works on Windows Phone 7 and 8. Do let me know if you have any other questions. “Error setting up your push channel. There may be too many apps utilizing push. Please help! I rely on your app and do not want to be forced to reactivate my Android device for Google Voice. I’m currently testing a new version that will hopefully aliviate notification issues. Would you like to be a tester? I would need your Windows Live email address. In the meantime, to resolve that issue (I had the same troubles recently) try turning off push in the settings (of the ClearDial app I mean) then turning off your phone and leave it off for at least 10 minutes. Then turn it back on, open ClearDial and go into settings and turn back on push. Let me know if does the trick! hi, when i run the app on my pc, i get the error message that clear dial notifier has stopped working and windows shuts it down automatically??? I believe you need .NET 4.0 installed. If you are not able to get it, let me know and I will make a .NET 3.0 version. Copyright Dutton Designs 2019 - Designed by SiteOrigin.